GROUP OF SIX TO DOW: 1939-45 Star; Africa Star; Pacific Star; Defence Medal 1939-45; War Medal 1939-45; Australia Service Medal 1939-45. SX 2748 W.L.Kohring. 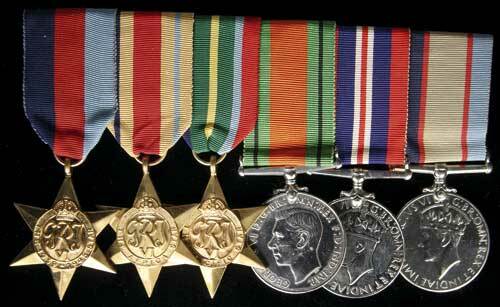 The Defence Medal is a replacement and is engraved, the rest impressed. Very fine - extremely fine. William Leonard 'Len' Kohring, born 27May1914 at Wallaroo, Sth Aust; Enl.14May1940 at Adelaide, Sth Aust; WIA 27Aug1942 at Milne Bay DOW 07Oct1942, New Guinea as Private in 2/10 Bn; Buried at Bomana War Cemetery, Port Moresby, PNG.